The Group 1 Moyglare Stud Stakes at the Curragh on Sunday features a clash of the early market leaders for next year’s 1000 Guineas. Aidan O’Brien has supplemented Tapestry who meets impressive Royal Ascot winners Kiyoshi and Rizeena in the best two-year-old fillies race of the season to date. 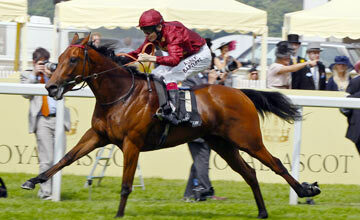 Tapestry is a daughter of Derby winner Galileo and readily won the Group Two Debutante Stakes earlier this month. She tracked her stable companion Perhaps on that occasion before being pulled out for a challenge inside the final furlong. Her rider did not have to be too hard on her to score by a length and three-quarters. Trainer Charlie Hills has elected not to run Kiyoshi since her scintillating win in the Albany Stakes at Royal Ascot. She was held up off the pace that day by Jamie Spencer before cutting through the field to win decisively. Once she hit the front, she deviated off a true line but was well clear of the other runners. Connections blamed greenness for her wayward course but it seems certain that Spencer will be holding on to her until as late as possible on Sunday. The form of the Ascot race is top class with no less than four Group races having gone the way of horses beaten by Kiyoshi. The runner-up Sandiva went on to land a Group 2 at Deauville on her next start whilst Lucky Kristale (6th) has won the Group 2 Cherry Hinton Stakes and Lowther Stakes. Princess Noor was well beaten in ninth but was a shock winner of the Group 3 Princess Margaret Stakes at Ascot on her next start. Everything points to Kiyoshi having a major chance on Sunday and she can be backed at 7-4 with Bet365. Clive Brittain’s Rizeena will be trying seven furlongs for the first time if she lines up this weekend. She won well in the Queen Mary Stakes at Royal Ascot but found Lucky Kristale too good at Newmarket subsequently. She has since finished third in the Prix Morny behind No Nay Never after making up late ground from the rear. Aidan O’Brien has also declared Bluebell, Minorette, Perhaps and Wonderfully among a field of 13 fillies. Perhaps would appear to the best of those on her performance in the Debutante Stakes. Jim Bolger has to choose from Agus Spraoi, Peony Fairy and Prudent Approach whilst Dermot Weld has declared Afternoon Sunlight and Carla Bianca.